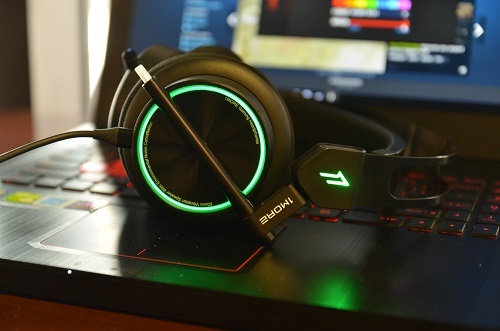 I’ve been looking for a gaming headset ever since I got my ROG Strix GL502VS gaming laptop. I thought one of my Beats headphones would do fine, until I kept on getting killed by opponents. I realized that I need more than just a simple headset. The Beats headphones I’m using are not enough to let me detect where my opponents are. There were several candidates, then our friends from Quantum Mobile Gears offered me to try out their newest product – the 1MORE Spearhead VR. It has 7.1 Surround Sound and its price is within my budget. 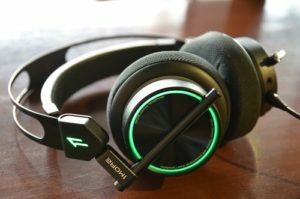 Will this become my first gaming headset? Read on to find out. The packaging of the Spearhead VR is a big box that can be opened like a three-fold book cover. 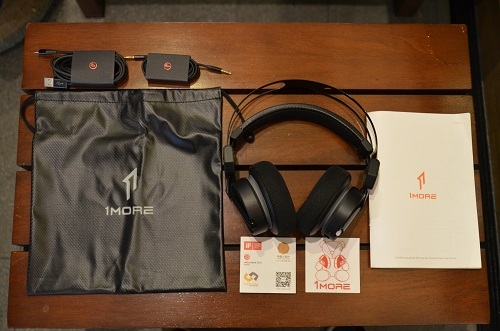 Inside the box are the 1MORE Spearhead VR, USB Cable, 3.5mm audio cable, manual, stickers, and a carrying pouch. Let me start the review by talking about the structure of the gaming headset. 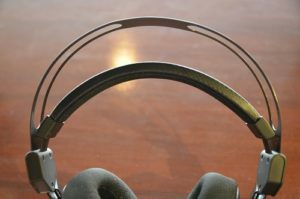 There are two bands on top – a padded band that is worn on the user’s head, and a black stainless steel that holds the the padded band and the earcups. 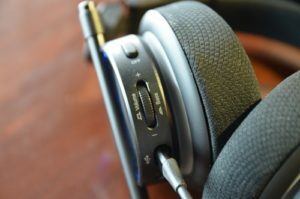 The padded band adjusts to your head until you place the earcups over your ears. This ensures a secured fit for wearing the Spearhead VR without worrying it will fall off your head. It never becomes loose on my head even with hours of playtime. It doesn’t feel heavy at all. 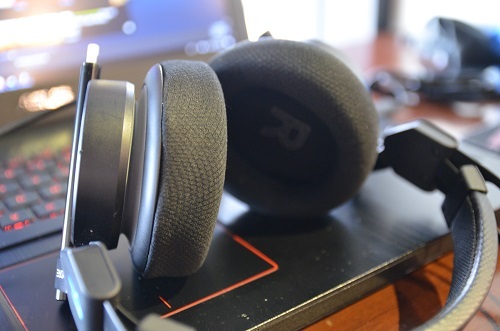 The earpads are made of fabric which are very comfortable to wear. 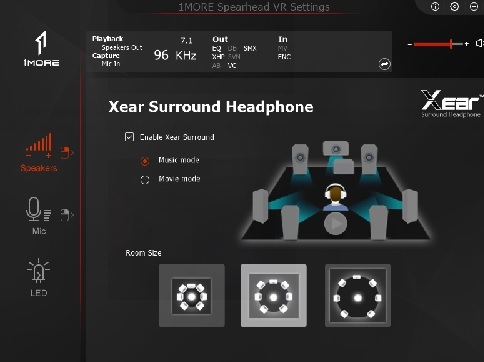 The design of the Spearhead VR’s earcups look unique. The small bars that hold the earcups are slanted instead of being parallel with the metallic band. There’s a good reason for this because these bars can be tilted according to the shape of your face, which again, ensures a secure fit. The ring outside of the earcups, the 1MORE logo on the metallic band and the retractable saber has LED lighting. With the help of the Spearhead VR PC Software, you can change the color, speed and effect according to your mood. Sadly, you can only choose one color at a time. Found at the back of the left part of the headset are control buttons and ports. There’s a switch to turn on/off the mic, and a volume knob. Clicking the knob will let you adjust the bass. The problem I see here is you won’t be able to know whether you’re adjusting the bass or the volume. Clicking the button doesn’t give any indication on which control was chosen. The only way to know is when you use the controls while wearing the headset. The two ports available are for the Micro USB and 3.5mm cables. The 3.5mm will work for gaming consoles and phones while the USB cable will work for PC/laptops. 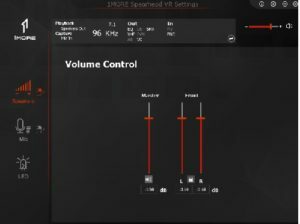 The advantage for PC users is they’ll be able to use the Spearhead VR PC Software that will enhance the sounds of the headset. I will discuss it in a little while. Overall, the 1MORE Spearhead VR’s distinct looks still makes it a serious gaming headset. Using the 1MORE Spearhead VR gave me a totally different experience for gaming. 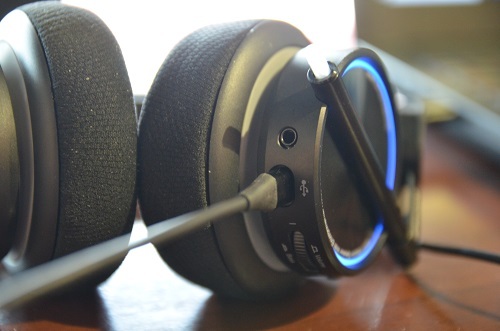 Compared to my music headphones, the Spearhead VR provided a lot more oomph to its sound. I was able to hear a lot clearly, even the faint background music played in different scenarios in Overwatch which I have never heard before. Gunfire and explosions were solid to my ears and the spoken bits by characters in Overwatch and The Division were clearly heard. In PUBG, I’m able to hear the footsteps of my opponents although there were time I found it confusing to discern which direction they’re headed. I also tested the microphone on Discord while playing with friends. 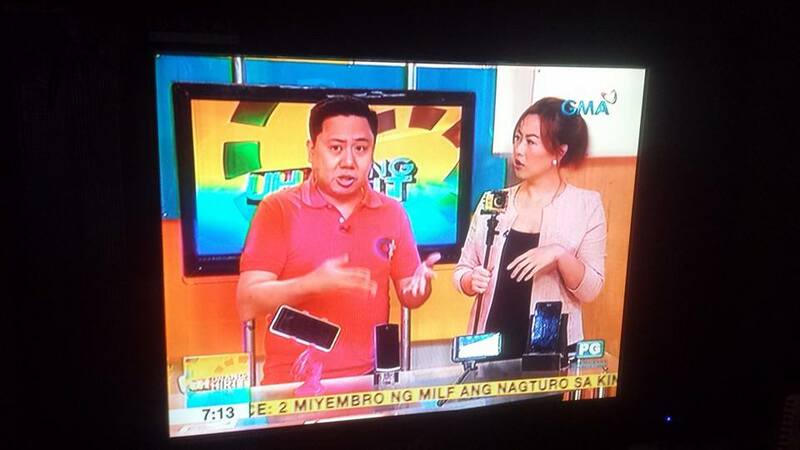 Gian Carlo Viterbo of Gadget Pilipinas told me that my voice was loud and clear even while we’re playing. The saber (a.k.a. as the mic according to the User’s Guide) is retractable. I don’t think it improved my voice’s volume when extended, but at least the LED lights work. Funny thing here is, I raved on the Spearhead VR’s performance even without adjusting the software. The software driver for the Spearhead VR is not included in the package but can be downloaded from the 1MORE website. 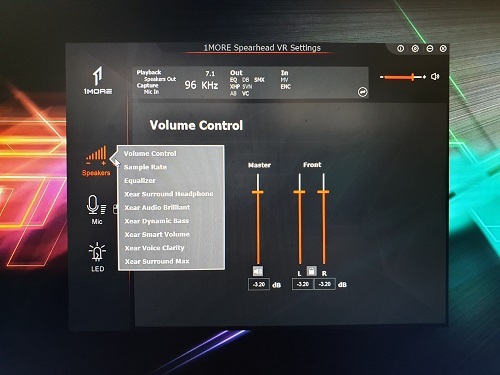 There are three main sections in the software: Volume, Mic and LED. The controls looked simple and I thought the only useful section here is for the LED. When I was all set to publish my review, I discovered that there are more settings that can be accessed by right clicking on the Speakers and Mic sections. 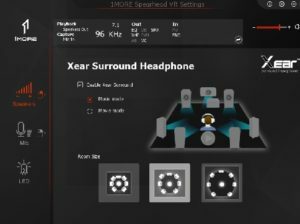 All along I thought I was already enjoying the Spearhead VR’s 7.1 Surround Sound. Turns out that I have to turn it on by selecting Xear Surround Headphone. 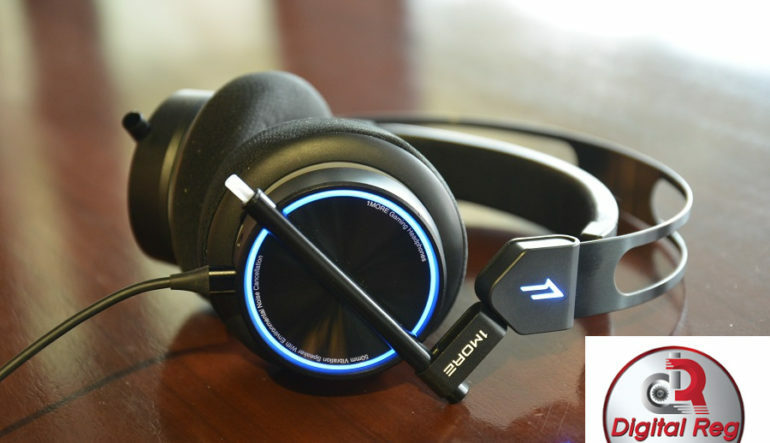 I played Overwatch and PUBG again with the Xear Surround and Surround Max turned on but honestly couldn’t tell the difference. It may have some effect on the music or videos played on the PC which already sounded fine even without the software. 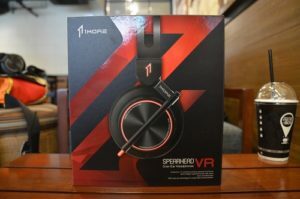 The 1MORE Spearhead VR opened my eyes (and ears) about the advantages of having a gaming headset. Even without the 7.1 Surround Sound turned on, it was still able to give me a better gaming experience. 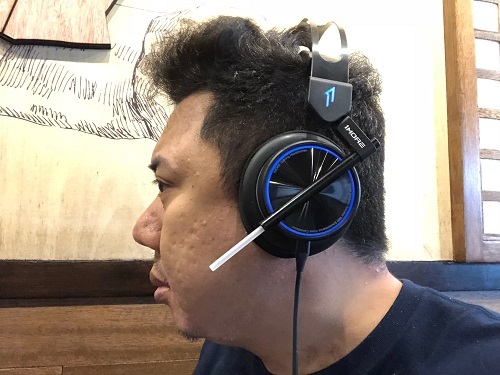 I felt naked on those rare times I played without bringing the headset. So yeah, I will buy the 1MORE Spearhead VR this week from the 1MORE Store at Shopee.PH and I’ll never feel naked again. It also receives a DR’s Choice Award as I highly recommend it for gaming. *Thanks to Quantum Mobile Gears for loaning me this review unit. Provides a secure, comfortable fit. No complaints of wearing it even for hours of gameplay. I could now hear the footsteps of my opponents. Works with voice apps like Discord. RGB Light effects only limited to one color. 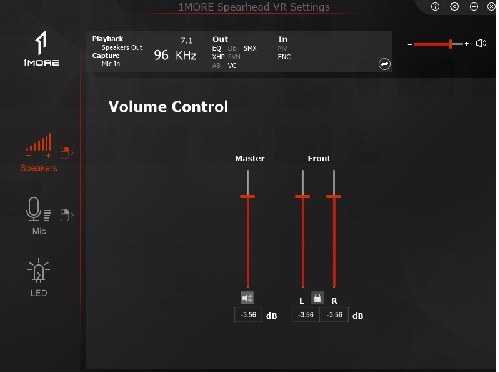 Volume and Bass controls are hard to distinguish unless headset is worn. Expected the Surround Software to greatly improve my game.